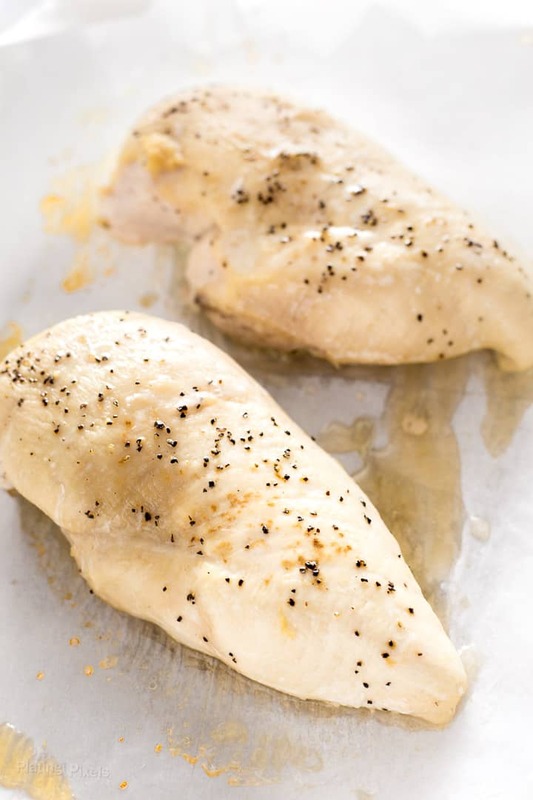 Have you tried baking chicken breast only to have it come out dry or overcooked? 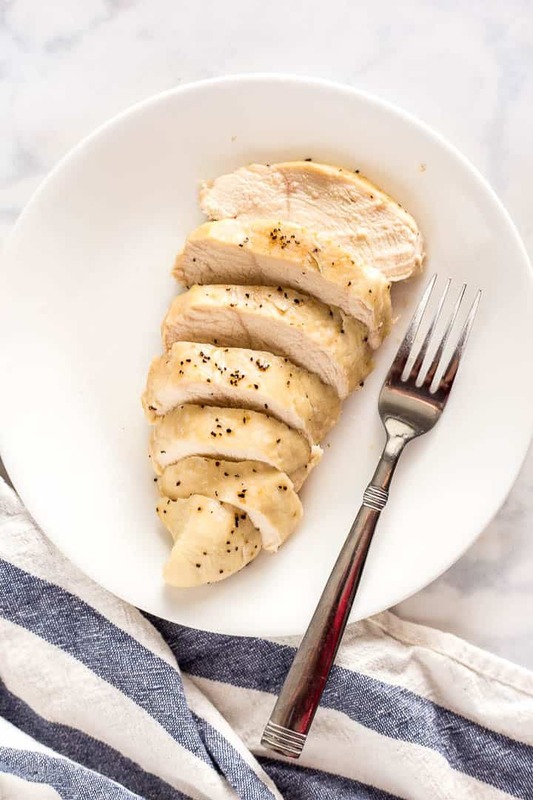 This post will show you how to bake chicken breasts that are moist and tender with just a few simple steps. You’ll never have to worry about dried out chicken breasts again. 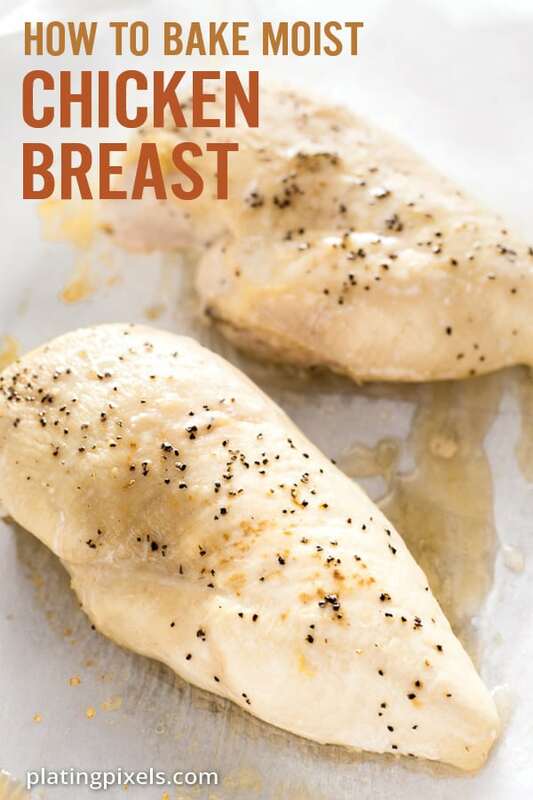 This popular post has been recently updated with extra tips, more photos, and a recipe video for easy baked chicken breast. Oven baked boneless skinless chicken breasts is a healthy and simple ingredient that can be used in lots of recipes. It requires little hands-on time and you can bake large amounts at once, and store extras in the fridge or freezer. There are many ways to oven bake chicken, but the most important thing is to not overcook, otherwise, you’ll have tough, dry chicken. Dark meat with bones is typically the moistest part of a chicken, however white meat can still be tender. Moist chicken breast in the oven is possible once you know how a few basic tips. When looking for oven baked chicken breast recipes, it’s important to know the basics. Read on for how-to and tips for baked chicken breasts. Bone in chicken breasts will be juicer, but boneless chicken breasts work just fine. Bring chicken to room temp, about 30 minutes, before baking for more even cooking throughout. Cook at a lower heat for longer to keep the chicken breast tender and juicy. Bake just until internal temp reaches about 160º F, then let sit under foil to cook to a safe internal temp. Line pan or baking sheet with foil or parchment paper for easy cleanup. Olive oil keeps chicken moist and adds extra flavor. Salt is critical for enhancing flavor. Salt does not actually have a flavor; it brings out and enhances the flavor in meats. However, too much salt will overpower the food with a sodium sensation. Change baking time according to the thickness of chicken breasts. See section below for tips on this. Follow these easy steps for moist baked chicken breasts. Preheat oven to 325º F. Line large baking dish with foil or parchment paper. Lightly drizzle with olive oil and sprinkle with salt and pepper (or other seasonings or your choice). Rotate chicken breasts and repeat for the other sides. Let chicken sit at room temp 30 minutes. Bake 30-33 minutes, or to an internal temp of 165º F with a digital instant-read thermometer. Note: This is for 8-ounce chicken breasts, smaller or larger breasts will slightly change the cooking time. Remove from oven and let rest under foil 5 minutes before serving. If you prefer gas grilling, this Grilled Chicken Breast guide will teach you. The safe cooking temp for chicken is 165º F, however, it’s best to bake chicken slightly under this as it will continue to cook as it sits. I recommend baking to 155-160º, removing chicken from the oven, and covering tightly with foil for 5-10 minutes to rest. This will hold in moisture and continue to build up more heat, cooking to a safe internal temp while staying moist. 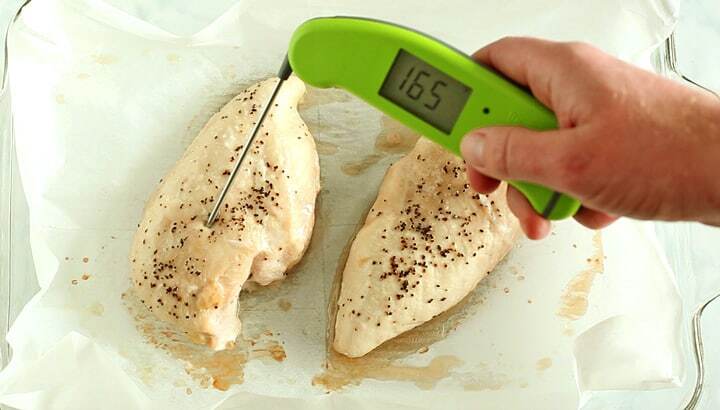 An average 8-ounce chicken breast will take about 30-33 minutes to bake at 325 degrees. If the chicken breasts are larger and thicker, they will take longer to cook. Smaller breast tenderloins take much less time to cook. 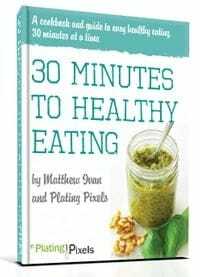 The instructions in this baked chicken breast recipe are for average chicken breasts that are roughly 8 ounces, and about 1-inch thick. Larger chicken breasts that are still 1-inch thickness should cook the same. Add 5-10 minutes for extra thick chicken breasts, about 40 minutes total. Thinner and smaller chicken breasts cook much faster, about 20-25 minutes total. Plan ahead and bring chicken breasts to room temp before you plan to cook, about 30 minutes, or do this while the oven is pre-heating. If not defrosted, you can cook from frozen. See below for tips on how to bake frozen chicken. Cook chicken breasts in bulk for leftovers, easy meal add-ins, or meal prep. You can bake chicken breast from frozen, but need to add a bit more baking time. Place on oven uncovered and bake 40-45 minutes to an internal temp reaches about 160º F, then let sit under foil to cook to a safe internal temp of 165º. Note: 10-15 minutes cooking time was added for frozen chicken. How long will leftover baked chicken store? Refrigerate in airtight container up to 3–4 days. 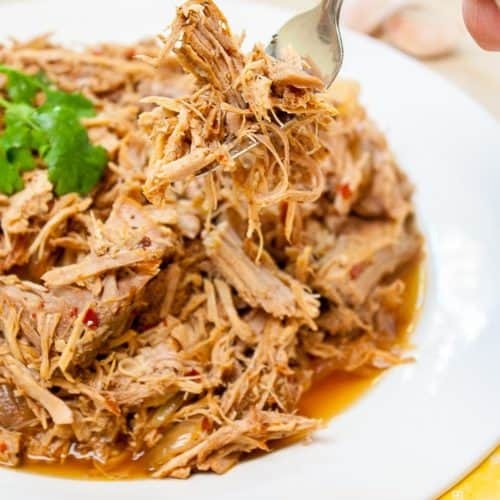 Freeze shredded or chopped pieces tightly sealed up to 3–4 months. I like to freeze in separate smaller bags for easy leftover portions. You can flavor roasted chicken with different herbs. Try sprinkling on some dried herbs such as Italian seasoning, basil or oregano. Fresh herbs such as fresh rosemary, thyme, and tarragon also work well. You can also add spices. Try garlic powder, cumin, paprika, red pepper flakes, curry powder and/or cayenne pepper just to name a few. Or go a step further and stuff the chicken by butterflying it (cut down one side of the chicken to create a pocket without cutting all the way through) and stuffing with mozzarella, sun dried tomatoes, and fresh basil. 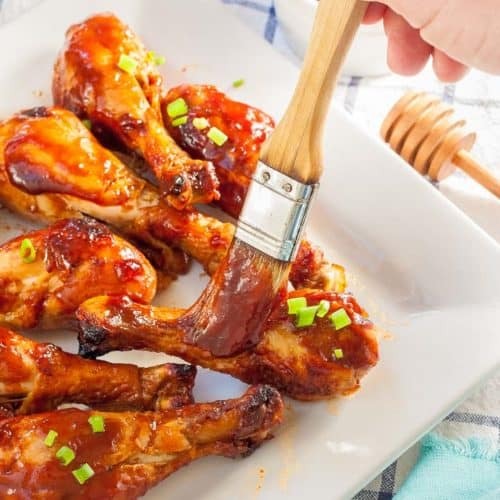 You can also learn how to make moist Oven Baked BBQ Chicken Drumsticks for another easy chicken dinner. 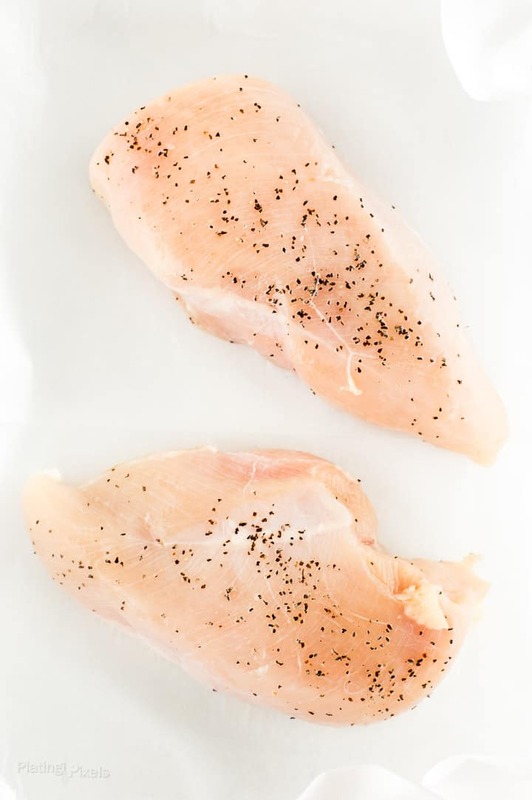 Follow these steps for simple moist oven baked chicken breasts, every time. These perfect baked chicken breasts may become a new family favorite. Lightly drizzle chicken breasts with olive oil and sprinkle with salt and pepper (or other seasonings or your choice). Rotate chicken breasts and repeat for the other sides. Let chicken sit at room temp for about 30 minutes. Bake 30-33 minutes or until internal temp reaches 160º F with a digital instant-read thermometer and chicken is no longer pink inside. Note: The safe internal temp for chicken is 165º F, but it will continue to cook as it rests. Remove from oven, lightly cover with foil to hold in heat and hold in moisture. Let sit 5-10 minutes before serving. Bringing chicken to room temp creates more even cooking throughout, but can be skipped in a pinch to save time. Lining baking dish with foil or parchment paper makes cleanup easy. Try adding extra flavor with herbs, seasonings, and spices such as Italian seasoning, basil, oregano, rosemary, thyme, tarragon, garlic powder, cumin, paprika, red pepper flakes, curry powder and/or cayenne pepper. Instructions are for chicken breasts about 1-inch thick. Add or reduce 5-10 minutes of baking time depending on thickness. If cooking frozen chicken breast, add 10-15 minutes baking time. Do not open oven until chicken is close to done as this will let steam out. No need to rotate chicken during baking. To save leftovers: Allow baked chicken to cool on a plate. Refrigerate in an airtight container up to 3–4 days. Store whole, shredded, or chopped pieces tightly sealed in freezer up to 3–4 months. WOW…. you took this to the next LEVEL!! You’re right, it is SO easy to overcook chicken breasts and end up with tough, rubbery chicken. This post is so helpful and detailed, I feel set up to succeed next time I cook chicken breasts for a family dinner! Great tips! Also, awesome photography! Now I’m totally wanting to eat chicken breasts so you’ve definitely done your job well! So many times I find chicken breast overcooked and tough. This simple straightforward recipe makes it so easy! Thanks for sharing. Thannnnnk you for this post!! Finally a well written post on cooking chicken breasts! Thank youu!! Mmmm does look like the perfect baked chicken! This is perfect! It would be helpful to print this off to always have handy when cooking chicken! Perfectly moist chicken breast every time! This is such a great resource. 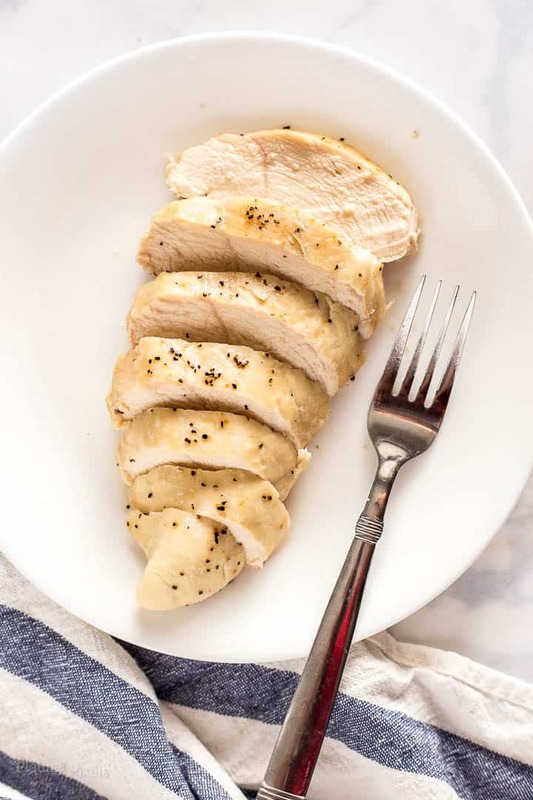 It’s always great to have precooked chicken on hand for so many other recipes, and these tips for keeping it moist are great! Turned out great! I put salt, pepper and cumin on it. Left it in the oven for quite a bit longer than what it called for. Turned out good. Thanks for the feedback Susie! Cumin would be a great addition. The cooking length can change depending on chicken thickness. I’ve added a bunch of extra notes to the post and that’s covered. I absolutely love the idea of cooking ahead and adding to recipes but when you add them to a recipe and you heat the chicken won’t it then be overcooked? Hi Trish. Technically any meat you recook will a bit tougher. If you add it to recipes with liquid, sauces, veggies etc. (plus helps if it’s cut into smaller pieces or shredded) you’ll hardly notice the texture. Hi Taylor, you can but it would add more time. I’d start with an additional 10 minutes if only slightly frozen. Then check internal temp and cook longer as needed. I did and have tried it. Sometimes simple salt and pepper is all you need too. Great tips Ebony. If I marinate I prefer at least overnight. If you do 4 days make sure you cook and eat right away. That’s getting pretty long for raw meat storage (unless frozen). Thanks! Hi Amy! Baking is one of the best ways to handle frozen chicken. Prep and bake it the same way as thawed, but expect another 20-30 minutes cook time. I’ve done it before and it comes out great! 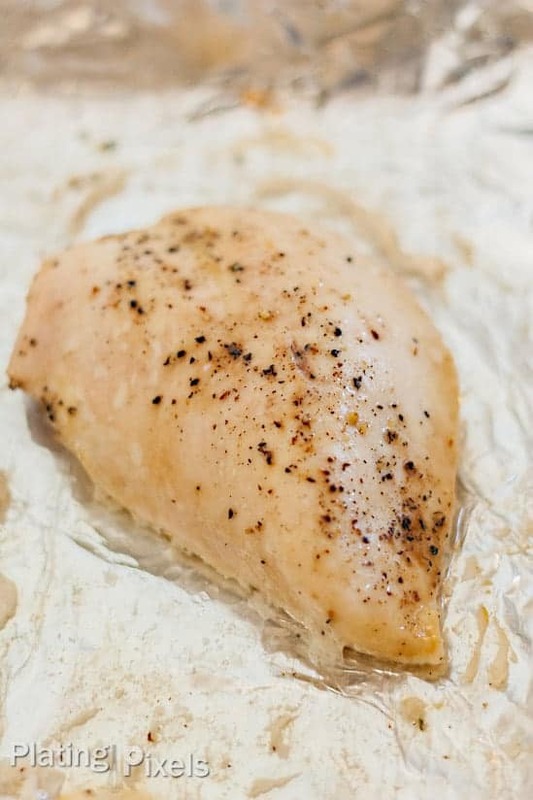 Do you cover the chicken breasts with foil while they are cooking? Looks great! Thanks Carlee. I’ve never tried that for chicken breasts. I assume it keeps more moisture in but affects the cooking time. For this recipe it’s written for no foil on top. Foil in bottom of the dish makes easy cleanup though. Great tips! I am not a fan of chicken breasts because they always taste so dry. I will definitely try these tips next time! I love how educational this is. And the chicken is so versatile. I did not realize that about salt! Thanks and glad it was helpful Rachael! I only recently learned that about salt. Even though every savory recipe I’ve ever created or cooked has salt and pepper. It’s kind of a thing for me. Once you get the hang of it, cooking chicken breasts is such a breeze! 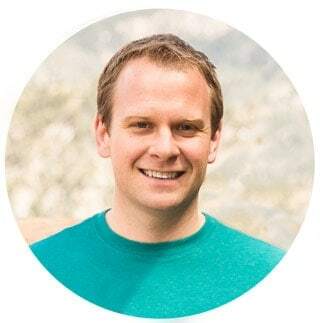 You have a great resource–thanks for sharing! It is Cathy, but it’s also tricky to learn if you’re new to it. For every recipe I write with chicken I still take the time to include proper instructions, instead of “cooked chicken”. You never know what level each of your readers is at. So many great tips here! I love cooking once and eating several times so this is absolutely perfect for that! Me too Michelle! I actually just used leftover cooked chicken breast for a meal last night. These are such great tips! I am going to have to try these next time! Thanks Britney. Hope they help! Thanks for highlighting these great tips! Some people just don’t get it right and nothing worst than dry chicken! Thanks Joanne. I assume it happens to all of us (me even sometimes). But hope this post held. This is a great how-to recipe! This is such a great post! I always seem to burn my chicken or make it too dry. I’ll have to use this post for the next time I’m making chicken for my lunches. I’m excited to try it! Thanks and you’re welcome Maegan! Glad this post could be of help and good luck! I’ll have to try this! My mom always makes the most amazing chicken, but mine usually turns out a bit chewy… and I bet it’s because I’m usually trying to hurry the process! I’ll be honest Jamie, I’ve done it too. Especially if I’m multitasking or not paying attention. This method takes the guesswork out as long as you pay attention to the timer. This is a great method. I think people tend to cook chicken breasts too quickly and they always dry them out. Good point Lydia. Besides pork, chicken is one of the easiest meats to overlook. Great tip! We eat a lot of chicken but it’s so easy to overcook leaving the chicken tough. I agree Victoria! There’s s fine line between just perfect and overdone. Thanks for the tips. I’ve been in a bit of a chicken rut…I forgot how much I love baked chicken. You’re welcome Margaret! Hope you get inspired for new chicken recipes. I got one posting tomorrow that is pretty unique! Love great chicken recipes…great for BBQing. Me too Justine! It’s so versatile. I have a grilled parsley and tangerine chicken recipe going up tomorrow you might want to check out. Great tutorial for tender, flavorful chicken Matthew. And good idea to cook ahead and freeze. So many recipes include baked chicken breasts! 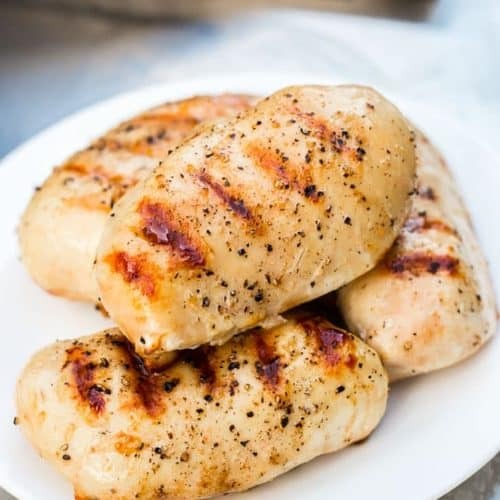 Great tips — we eat a lot of chicken breasts during the week and I usually pound them out and toss them on the grill pan, although this method makes for a smoky kitchen sometimes. Hi April. That’s a great way to cook them as well. If I make a sauce based pasta dish or just want to cook 1 or 2 chicken breasts real quickly that’s my preferred method.